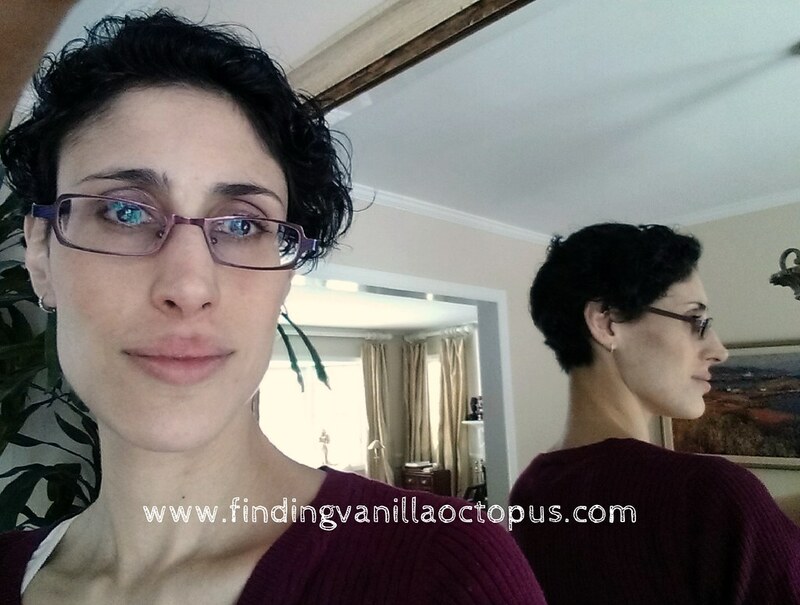 Finding Vanilla Octopus: Snow and a Haircut- What a Trip! I've been hiatus since Sunday; partly due to laziness, partly due to exhaustion, partly due to distraction, and largely to do with a distinct lack of motivation. However, I have not been idle. I've instead been pouring my energy into working on my cross-stitch project and preparing (even if only in my own head) for our upcoming trip to New Jersey. We had intended to leave on Thursday morning, and played around with the idea of instead driving through the first part of the children's bedtimes on Wednesday night. However, as forecasts everywhere we looked began screaming about yet another winter storm, we decided that the earlier we could get on the road and out in front of the storm, the better. This particular storm was promising to be a doozy, and since none of the newscasters were changing their stories about it over the course of its approach (except to increase their predictions on total precipitation) I began to take all of the hype very seriously. Perhaps that's how Tom and I actually managed to get out of the house a good forty minutes earlier than our soonest projected hopes, and the drive went even more smoothly than I could have hoped for. About five hours (which included a twenty-minute stop in Delaware) after saying goodbye to our home sweet home, we were rushing babies out of the cold wind and through the warm and welcoming front door of Nana and Papa's house. There was old, packed snow on the ground aplenty but not a flake of snow yet in the sky. The fluffy whiteness began its ascent right on schedule, around midnight, and quickly picked up speed. By Thursday morning, there was a pretty astonishing layer of whiteness all around, and the air was still aflurry with swirling drifts of powder. Much as I enjoyed the beauty of the landscape, I couldn't help but feel a pang that we were witnessing it so far from home, where have we received a near-equal amount, but where such an event is far more rare an occurrence to behold. 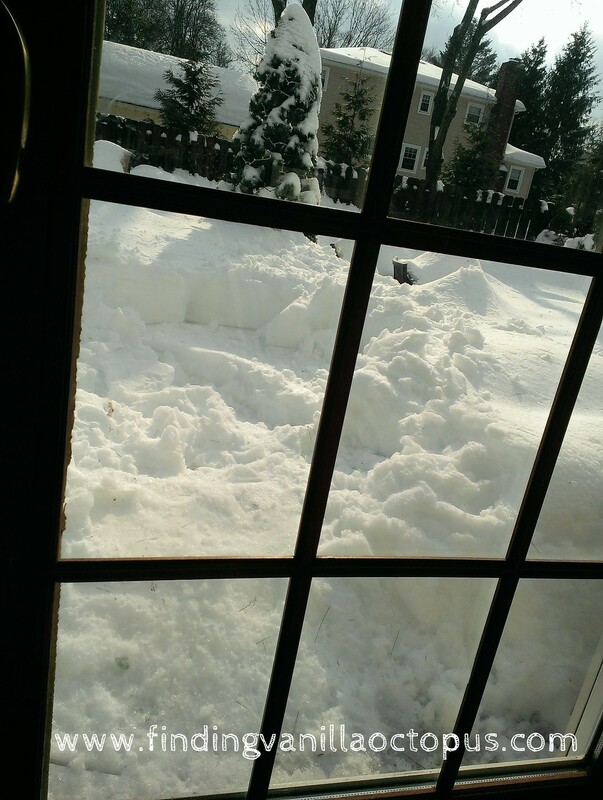 Belle, the family dog, has been working hard to carve out a little corner for herself in snowdrifts higher than she can stand. However, if one is to be snowed in for a day or two, better to experience it in good company, and we most definitely have. 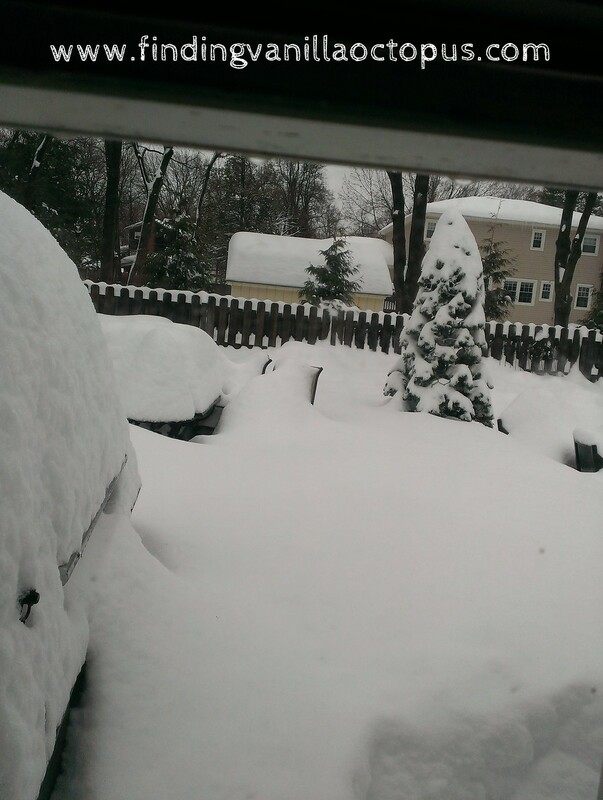 We let only one day of enclosure go by in the end, and despite receiving an additional three inches last night, we made a point to get out-and-about today. After all, there was my hair appointment to keep, which was canceled over Christmas with all of our other plans. I decided to do something drastic, partly out of intense frustration with the insane levels of hair that I've been losing after the birth of each of my babies and beyond, and the constant tearing and tangling that occurs as a result of putting it up while still wet to keep it from tiny probing hands; mostly out of a new-found need for big personal change borne of the recent horrible experiences I'm still trying to put behind me. I'm still feeling like a stranger to my own reflection for now, but I think that this new gal and I will soon become great friends.